The project is situated in a strategic site between Luxor and Aswan cities, nearby Markaz Edfo. The museum’s architecture and its disposition on the Jazirat ad Dabhaha island’s riverside try to focus attention on the Nile’s historical relevance in the development of the Egyptian civilization. The project proposal has intentionally a moderate size – 1,500 m2 for exhibition spaces and 210 m2 for services, with a maximum capacity of 500 people – due to the relationship with the demography of the closer cities. The relatively small dimension of the new museum is also researched to avoid any competition with “the world’s most extensive collection of pharaonic antiquities” contained in the Cairo’s Egyptian Museum. The project aims at the creation of a monumental, sacral and evocative exhibition space, able to present itself as a new draw and point of reference for the Egyptian cultural heritage. This new architecture is developed on three essential points: the relation with water, the monumental space and the traditional Egyptian architecture. The buildings stands on a platform of 50 cm of height, that redefines the riverbank and shows up to visitors the entrance in a new sacral space. The museum consists of three volumes: the first one contains the info-point, the bookshop and services, here visitors will be able to get information and learn about the museum history and collections thanks to interactive video panels; the second one contains the permanent exhibition – made up with monumental archeological evidence, as columns and statues – here, light, enters in the huge open space directly from the top of the volume and gets filtered from the side walls; the third volume hosts two empty and “floating” floor - one in air and the other one on water – dedicated to temporary exhibitions and events. 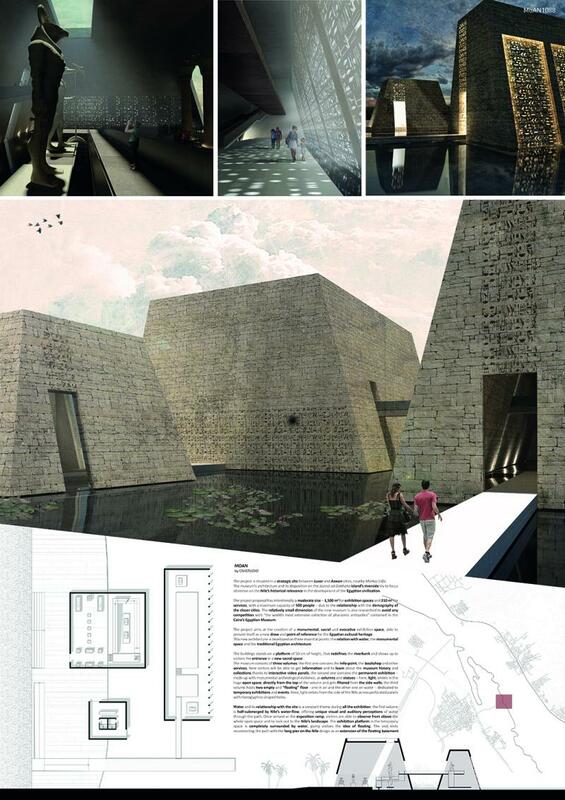 Here light enters from the side of the Nile across perforated panels with hieroglyphics-shaped holes. Water and its relationship with the site is a constant theme during all the exhibition: the first volume is half-submerged by Nile’s water-flow, offering unique visual and auditory perceptions of water through the path. Once arrived at the exposition ramp, visitors are able to observe from above the whole open space and to look out to the Nile’s landscape. The exhibition platform in the temporary space is completely surrounded by water, giving visitors the idea of floating. The visit ends reconnecting the path with the long pier on the Nile design as an extension of the floating basement.